Astell and Kern makes limited edition stainless steel AK380 hi-res player | What Hi-Fi? The stainless steel model from Astell and Kern features a slide-on headphone amplifier and carry case, at the not inconsiderable price of £4800. 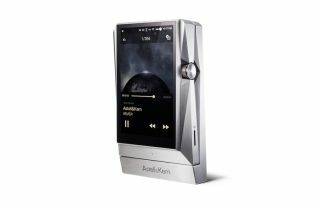 The AK380, the new flagship hi-res audio player from Astell & Kern, is now available in stainless steel finish, for a limited run. With only 200 of these players being made, the Stainless Steel package retails for £4800 - £1800 more than the standard edition, and making for a particularly expensive Valentine's Day present, if you were so inclined. According to the company, the player is "dramatically milled from a single solid block of stainless steel", and comes with a matching slide-on headphone amplifier and carry case. On the inside, it has the same dual 32-bit DACs and advanced jitter reduction as the non-stainless steel version, 256GB of built-in memory, as well as wi-fi and Bluetooth connectivity. MORE: LG G6 smartphone will have a built-in Quad DAC for "best sound"